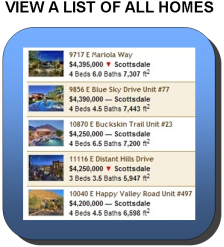 From this page you can easily browse all Golden Keys AZ townhomes and condos for sale from the Arizona MLS. Our listings are updated daily! Square Footage: 1,394 sq. ft. - 2,584 sq. ft. The beautiful Arizona Country Club which is one of our older country clubs with a rich history, is within a mile of the community. Other courses in close proximity are the Continental Golf Course, Papago Golf Course and The Phoenician Golf Club. If you head out to the NW side of the valley, 55+ communities (active adult communities) are plentiful. In Scottsdale, you're limited to a select few such as Villa Monterey, Scottsdale Shadows, Seville East and Golden Keys. 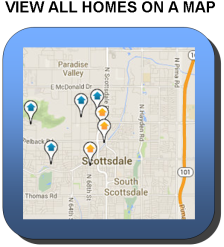 Golden Keys is located in South Scottsdale, just north of 64th Street in the 85251 zip code. The location is outstanding. Two miles to Fashion Square Mall, two miles to Old Town Scottsdale, half mile to Fry's Food & Drug (grocery store), and seven miles to the Phoenix Sky Harbor International Airport. Annual homeowners association dues of $650.00 are a bargain, and are used to maintain the common areas, heated pool and rec room. The City of Scottsdale Paiute Senior Center is approximately one mile away for those looking for additional social interaction and activities. The homes were built in 1964, so you never know what you're going to find when you look at these properties. You'll walk into one, and it will be beautifully updated with granite countertops, new cabinets, new appliances, and travertine flooring. The next will be almost completely original. The large, private backyards are unique to townhomes in general. There's plenty of room for a bbq, fruit trees and in some cases even a pool. Perhaps our favorite feature is the easy access to the Arizona Canal Trail where you can walk, jog or bike for miles. Get to know Golden Keys in 51 seconds with our community tour uploaded to YouTube in HD.